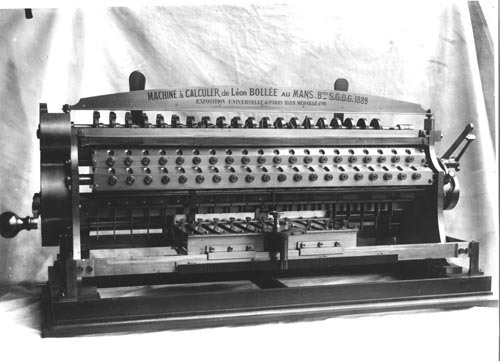 B&W image of an early calculating device. Label above device: "Machine a Calduler de leon Bollee au Mans. Btee S.G>D>G. 1889"
"Exposition Universelle de Paris 1889 Medaille d'OR"
Verso. Two black stamps by H. Roger Viollet museum in French. Verso in pencil" Inventions Machines a Calsuler" and "Boyer 2202 Machine a calculer Leon Bollee - 1889"